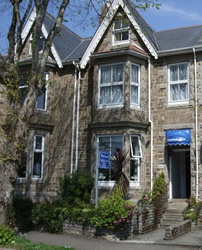 Penmorvah is a family run Guest House situated on a tree lined road in central Penzance. It is a short walk to Penlee Park, the Prommenade, the town centre as well as Penzance's many restaurants, gallerys and transport links. All rooms are en-suite and have tea & coffee making facilities and are serviced daily. Towels are provided along with a Hair dryer. An ironing board and iron are available on request.